Here’s a peek at what the new Brenau home page looks like. Click on the image above to try it out. 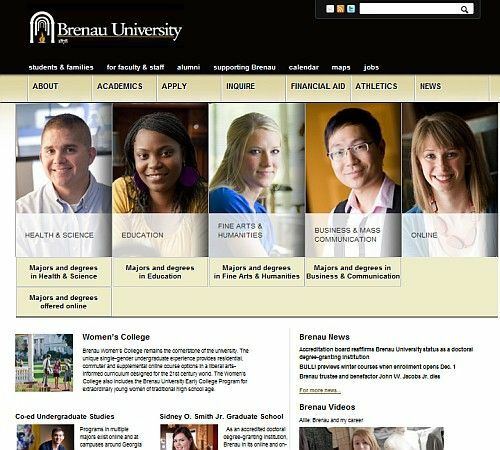 There is a new look and some new functionality for the main university´s Website, www.brenau.edu. Although the underlying technology is quite different – and a lot more stable than the previous Web site – the navigation is essentially the same. And there is a great improvement in the search capabilities. To explore the site, you may have to clear out your old Web browser´s cache by erasing your previous browsing history (you can leave your passwords and other user features alone, however). It is a relatively easy process. (In Internet Explorer, for example, look for the first option on the “Tools” menu; In Mozilla Firefox, it´s the “Delete Browsing History” item under that “Tools” menu). If you find something that is not working properly or you encounter missing or outdated content, contact Rudi Kiefer at ude.uanerb@refeikr or 770-534-6166. Next PostNext A special greeting: For some employees the season brings ´joy´ of additional taxes.